The almost identical in design Mickey’s Magical Party banners have been switched out for these new canvas banners on every lamppost in sight, alternating between the French and English logos. 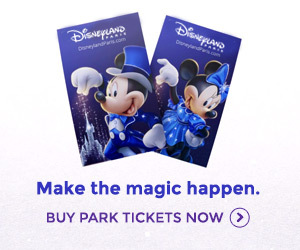 Are these just unoriginal, or is blue just a nice, neutral colour that works for both parks? Either way, there’s one plus for this year’s batch of near-identical banners — they’re slightly less identical. In Front Lot, there are several designs featuring just the New Generation characters, such as Mike Wazowski, Buzz Lightyear and that ten-year-old alien who won’t ever take a break, Stitch. What is this festival called again?! Back at Front Lot, we’re seeing the Walt Disney Studios Store entrance being “toyed” with again, as the first temporary marquee in over a year has appeared to tempt more people inside the boutique. It’s the first New Generation Festival store decoration so far, coming just days after the old Magical Party marquee disappeared from The Emporium. Though the Little Green Men and Stitch are flat 2D designs, Slinky Dog is partially in 3D, his springy body wrapping around the entrance. Inside, you can of course pick up your very own Slinky toy. Inside the park, the Monsters Inc. Scream Scene near the entrance of Toon Studio has been closed for several weeks to allow preparations for its starring role in the year ahead. The ‘Scream Monitors’ signage has been taken away and returned for refurbishment, and the fun yellow floor markings have been completely repainted. In fact, though the corner is being included in the “new” features for the year, it has been in place for so long (since 2006) that the “Child Detection Agency – Scream Scene” paint had completely worn away. As we reported at the end of January, the ‘Monsters Inc. Scream Academy’ listed in brochures and press releases was originally meant to be a brand new show that was cancelled just days before auditions. We’ve since leant that the show, which would have featured a live host inviting guests to dance and scream with the Monsters, was actually set to happen not in this tight corner but on a separate travelling stage, similar to the High School Musical shows. At least with Sully (the only live Monsters character we’ve seen at Disneyland Paris since 2002), expected to be rejoined by Mike and — for the first time — Boo (dressed up in her Monster disguise) for the Disney Showtime Spectacular over at Disneyland Park, these extra characters could hop over in between to provide something “new” here after all. *sigh* – the whole New Generation Stuff just looks realy cheap to me – from the new attractions to this Banners… there is nothing of the extra magic, the special style, wich disney stands for. It’s a bit too simple for me. Im going to Disneyland in a weeks time for the first time and can`t wait!! The only thing im a little concerned about is the state of the studios. There is so much work going on which means those temporary “walls” have gone up around S..T.T and Monsters inc, which spoils the beauty of the park really!! But it still doesn’t put me off!! CANT WAIT TO GO!! Cool, even though I liked Mickeys Magical Party this looks pretty good. Loving the marquee over the store – really good. As for the banners, I don’t think that they look all that bad (I quite like them – cheap or not) however there does seem a few too many at the entrance lol. Can’t wait ’til I go in August – New Gen Festival I think is a great idea! I quite like the 3D-ness of Slinky Dog! craig shaw, I really disagree with you. Since 1992 we can almost see the same characters year after year! Everytime I visited DLRP I saw almost the full “classic cast” and some other old characters like Rafiki, the twins from Alice, Sulley, Woody and a few others. I think it is already time to see something new! I mean, the kids that now go to DLRP are not kids from the time of Alice in Wonderland or The Lion King, they are kids from the time of Stitch and some other Pixar movies! I think that one year dedicated to the new generation is great because, when this year is over, I dont think that DLRP will throw away the new characters created for this season. Even though DLRP has been added new characters since its opening (like Sulley or Stitch) I think we need something new, like Wall – E or the old man from Up (I’d love to get a photo with the guy :p, but I dont think that will happen, even with this festival). I can’t wait for NGF and I hope I can go to DLRP this year. As i have already been and seen the NGF i would have to say it was fantastic ! Much more entertaining….although i did like Mickeys Magical Party the NGF really is a step up more interaction at the front of the castle from the characters…….photo`s galore they even allow you to have pictures taken with them while they are waiting to go on stage !! I say well done Disney it is fab !!! Can`t wait to go back to see it all again !